Grenville is back on Saturday night BBC1 TV as one of the 100 judges in the second series of All Together Now. Here is Grenville with All Together Now presenter, Rob Beckett and his good friend Ged Thompson. One of the pieces sung by the massed choirs at a concert organised by Grenville in Bath in September was the beautiful CALM ME, LORD - words by David Adam, music by Margaret Rizza. The accompanist was Phil Ridgers with violinist Lizz Lipscombe. Grenville's special guest that night was Mr Aled Jones - A wonderful evening! April 2019 - Singing is a great hobby, whether as a new experience or for those who are missing the choir that they used to be with. Whatever your age from 6 to 96, or your singing background, Grenville has a choir for you. Click HERE to find out more! Singing in a 'Grenville Choir' is something very special. It was announced in September that Grenville's Goldies Charity won the prestigious 2018 National Lottery Awards, Education Category. An amazing achievement! Picture shows Grenville receiveing the award from celebrity Soprano, Katherine Jenkins. The Bath Male Choir in full voice! Grenville being presented to The Queen. 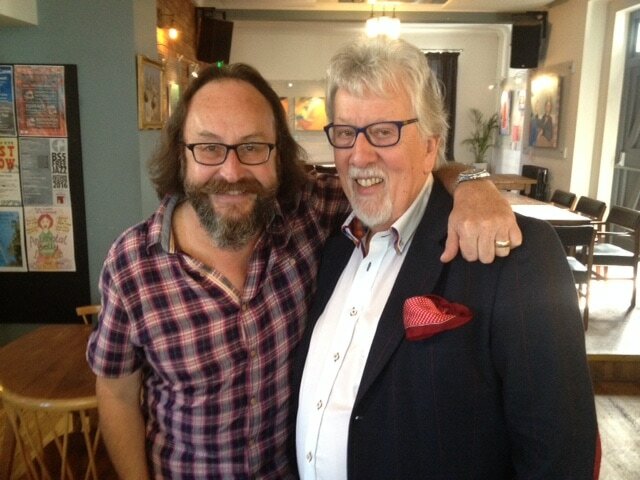 Dave Myers presented a BBC1 programme featuring the Goldies Charity. The Golden-Oldies Charity reaches out to brighten the lives of older isolated people across England and Wales. WELCOME to the website of Grenville Jones D.Litt, a highly respected charity founder ( The Golden-Oldies ) and a musician who has helped to raise over a £million for many local and national charities over the years. Grenville has appeared on TV and radio across the World through his charity and as a choir leader. You may spot him in the second row as one of THE 100 judges on the Saturday night BBC1 talent show All Together Now. He is the founder of 11 choirs, and an author who lives in the City of Bath with his partner Jacky. He has three sons, Daniel, Kieron and Laurie, and six grandchildren. 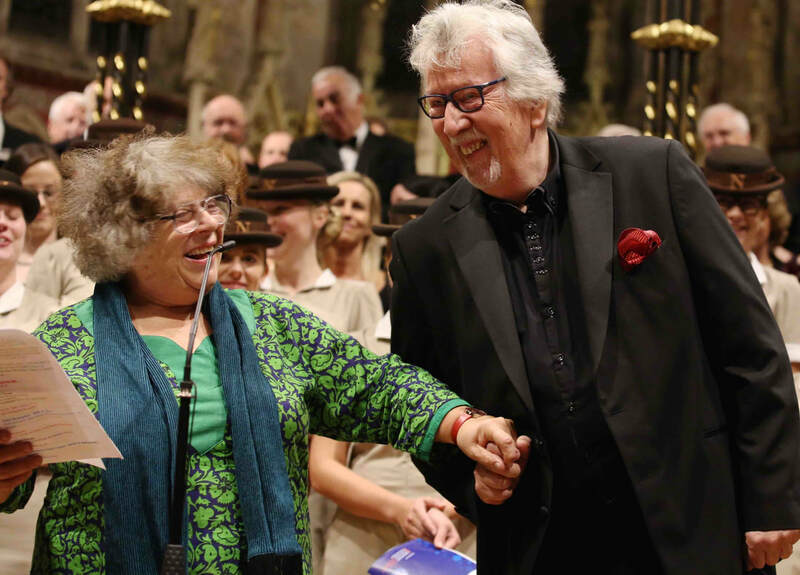 Aged 68, his driving passion is to get people of all ages singing and BELONGING to a group where they can make friends, enjoy themselves and have fun through music. “Singing on prescription” is at the heart of all Grenville does. 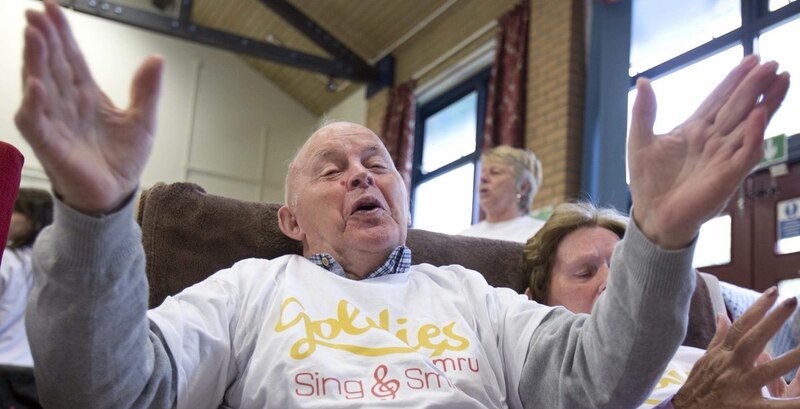 As founder of the Golden-Oldies Registered Charity (1121600) he started in Bath 12 years ago with four daytime sing-a-long and activity sessions for socially isolated people (Goldies is not a Choir! ) which now runs over 160 across England and South Wales as Goldies Cymru. 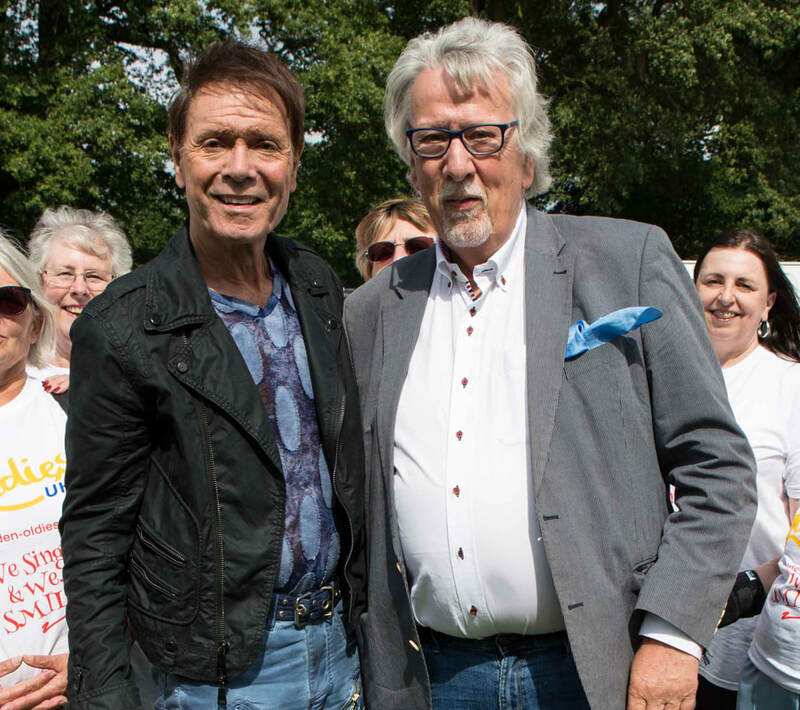 Sir Cliff Richard is the supportive Patron of “Goldies,” as it has become known, and its open-access sessions are attended by hundreds. Goldies is making a BIG difference to the lives of older people. There are now over 50 session leaders and Grenville’s ambition is to see the charity – under the banner Goldies UK - operating across the UK, bringing joy to thousands of people, reaching older people with learning difficulties as well as those with Alzheimer’s and Learning Difficulties. The Charity reaches across Essex, the Midlands, in North Yorkshire, Cornwall and North Devon. A major new Lottery Wales Grant, announced in March 2017 saw an additional 50 daytime sessions added up to 2020. The first all-singing Goldies Charity shop opened in the town of Keynsham in March 2016. Another project driven by Grenville. ​His choirs include the auditioned mixed-voice choir THE Bath Chorus, the Last Choir Standing and much travelled, Bath Male Choir (heading for BOSTON MA later this year) the non-audition, evening Bath Welcome Choir. He leads a number of Good Afternoon Choirs these are now in Bath, Devizes, Keynsham, Bristol, Yate and Chipping Sodbury, Thornbury, Frome, Wells and our newest Good Afternoon Choir started in North Somerset in September. In January 2018, due to his continuing work commitments, and after 7 memorable years he reluctantly stood down as Musical Director of the Norland College Choir. Hundreds of people sing in his choirs and thousands enjoy their Goldies sessions. He has also supported a many charities in recent years raising thousands of pounds. These include Save the Children, Prostate Cancer, Parkinson's UK, The British Heart Foundation, The National Osteoporosis Society, MENCAP and many smaller West Country charities. Grenville is Patron of the Cornwall Community Choirs Association and also (when time allows) takes “Everyone can SING!” workshops around the UK. He worked last year with the BBC on the Heritage of World War One songs and in particular the songs of Fred Weatherly. Back In 2016 - Grenville presented a programme for BBC Radio based on the life of the songwriter, Fred Weatherly. Fred lived in Bath in the 1900's, included in his titles was "O Danny Boy" - It is not widely recognised but the most popular song of WW1 was entitled "Roses of Picardy"...written by Fred. You can hear this clip by clicking HERE. ​He has an office in Westfield near Bath, where Jody and Nikki keep everything running smoothly. In July 2012 he announced his personal super dream to raise £20,000 to take children from a Mencap group with severe learning issues to Paris and Disneyworld. Nine months on (in February 2013) with the fantastic support of many of the people in his choirs and local organisations he achieved the target. Grenville will be supporting the brilliant Super Saturday Club this year. 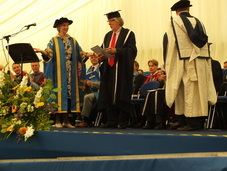 Also in 2012 he received an honorary degree from Bath Spa University in recognition of his contribution to music in the community. He attended a Garden Party at Buckingham Palace at the invitation of the National Lottery where he was presented to the Queen. Through his music and charity work he has been interviewed on radio and TV many times across the World. In the past he has worked with Gareth Malone on Children in Need, and on stage at concerts produced by himself with Katherine Jenkins, Aled Jones, Alfie Boe, Jamie Cullum, Rhydian Roberts, Lee Mead, Russell Watson and Hayley Westenra. 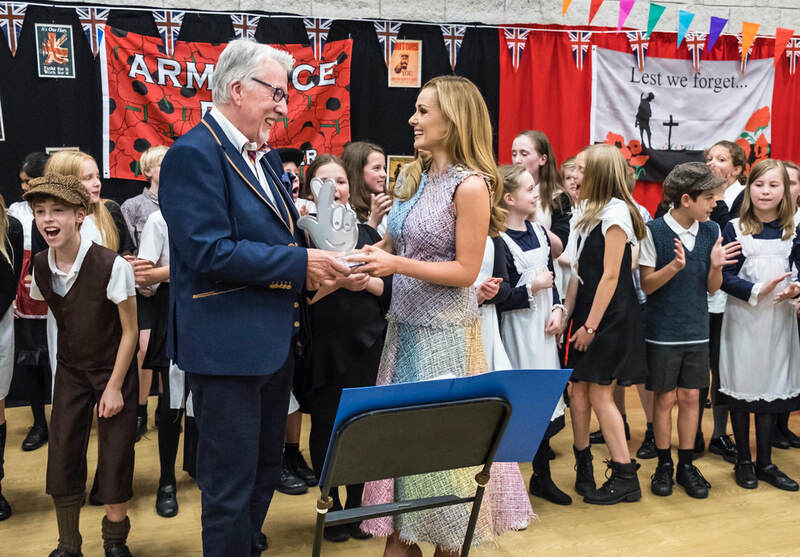 In October 2018 he was presented with the 2018 National Lottery Award/ Education Category by Katherine Jenkins. This was for the WW1 school intergenerational project from his Goldies Charity. Victoria Primary School in Penarth, South Wales and Grenville chats to one of the ladies who attend the local Goldies Cymru session. The Charity started by Grenville in the West of England 11 years ago now reaches out to hundreds of older people and young people in Schools across England and Wales. Grenville’s work please email him.